The PKI 9205 is a very rugged, portable barrier specifically developed for police and military personnel in order to stop vehicles instantly. Designed for the use by just one person it is an inexpensive tool which can be deployed in seconds at a road block. Alternatively it can be used semi-permanently to protect a target building. Any vehicle passing over the PKI 9205, no matter its speed, will have its tyres instantly deflated by the 50 mm spikes quickly, safely and effectively. The unit comes as a complete kit and consists of two separate sections, each of which can be extended up to 3 m and contains 45 spikes. PKI 9205 is made of a mix of Nylon 66 and glass fibre making it flexible but yet firm. The stainless steel spikes with a length of 50 mm long and a diameter of 4 mm diameter will penetrate through all types of tyres. 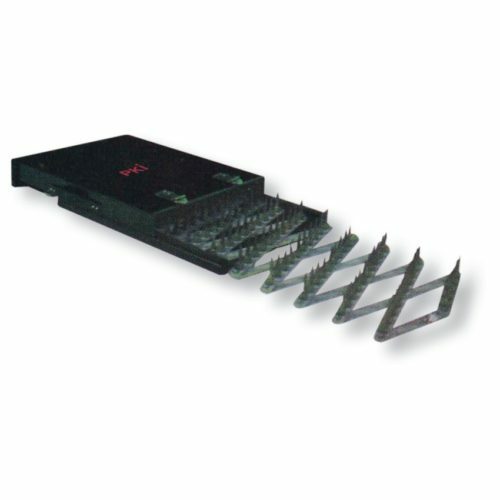 When the spikes penetrate a tyre they break off from the base and therefore a sparekit comprising spare spikes, pliers and screwdriver is provided with each PKI 9205.